Hey all you people who just finished marching this summer! We're running out of Forzato pics! Hurry up and e-mail your best shots from the summer to dave@dci.org along with where and when the photo was taken. Send some biographical information about yourself as well. We'll give you full credit. Also, let us know if you want your e-mail address included. 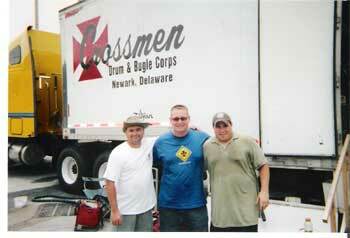 Kevin McDermott sent in this one, taken on July 28 in Kennesaw, Ga.. "This photo is of (from left to right) Chris Hoover ('92 Crossmen alum), Craig Birkett ('92, '93 Crossmen), and Kevin McDermott ('92, '94 Crossmen). The three of us had decided to volunteer in the kitchen truck for 10 days, from July 23 - August 1. The three of us had a great time, and our reward was knowing that we were making a difference in the daily life of the Crossmen on tour. It was no picnic, to tell ya the truth. The food staff works their tails off, and boy do they get it done. The members were extremely polite and very eager to learn of our experiences as "old bones." We'll do it again next year if our schedules allow. Go Crossmen!" Thanks Kevin!